Thinking about doing some summer knitting? Knitting is often thought of as just a winter craft, knitting with wool in hot weather is not anywhere near as pleasant as knitting in the dead of winter while sitting in front of a roaring fire. But depending on your choice of yarn, knitting during summer can be just as satisfying. And let's face it, for some of us, waiting to start knitting until the cooler months would mean that the jumper would not be ready to wear until the following year! Summer hand knits tend to be knitted using lace patterns or large needles to decrease the density of the knitted fabric and allow air to circulate more easily. Generally, when most people think summer knitting yarns, they tend to think about knitting cotton but you can also use light weight acrylics or bamboo yarns for your knitting. Cotton knitting yarn is soft and light-weight, making it ideal for knitting summer clothing and accessories. It also tends to be more comfortable to knit than other yarns (like wool for example) during summer but it is generally not recommended for beginners. Bamboo is a relatively new entrant to the market. As with cotton, the yarn is soft and light-weight but it also has a lovely sheen that compares favourably to silk or cashmere, and the knitting fabric is now being used by fashion designers as a low-cost substitute. There are quite a few acrylics and acrylic blends that are suitable for knitting into summer garments, particularly the ones I call novelty yarns. Some of these yarns are difficult to knit, well more difficult that a smooth yarn anyway, but the effect of the yarn knitted into fabric, can be rather nice. It is hardly a surprise that there are many more knitting patterns for Winter Clothing (Scarves, Hats, Jumpers and Blankets) in your local craft store, but if you have a good look yu might find a few current pattern books or leaflets for Summer Wear. Most of this years new patterns from Australia's big four (Patons, Cleckheaton, Panda, and Shepherd) are for crocheted items and there really are not many as quite a few of the summer yarns produced over the last five or six years have been discontinued. But there are plenty of patterns online. Check out eBay or search online for vintage patterns. Summer knits were big in the forties, fifties, and sixties, quite a few of them are public domain (free) and you might really like the 'retro look'. 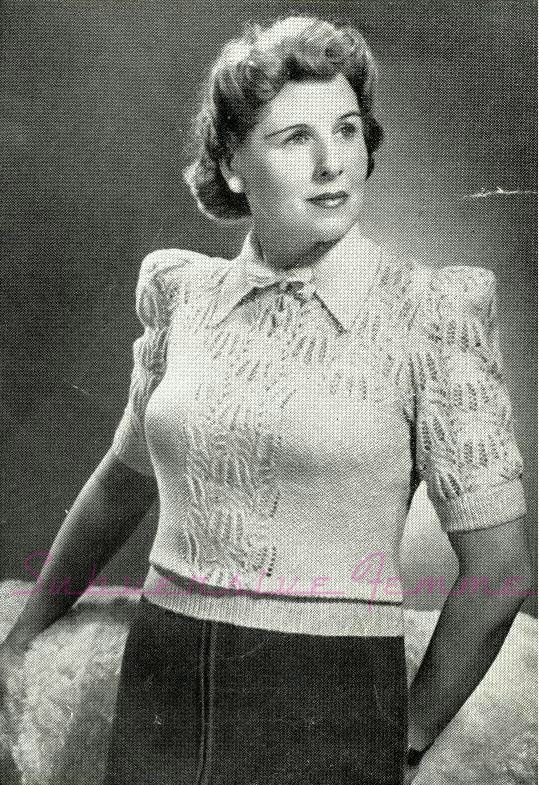 One site I really like for Vintage knitting patterns is Subversive Femme, the pattern in the picture above is from that site. Just click on the link or the image to go to the site to check out all of the patterns available there.